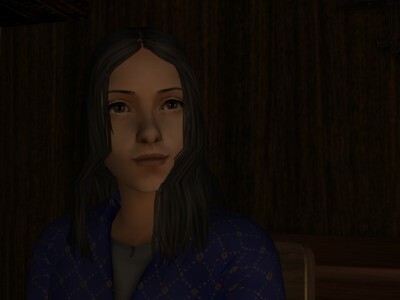 “I hope it’s no one looking for me,” Alred said. “If it’s the devil, I shall tell him you’re out,” Egelric said as he went to the door. 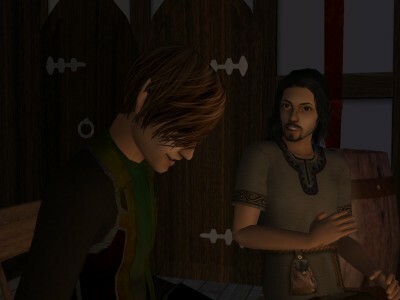 Wulf and Gils sat transfixed at Sela’s feet, wondering over the unfamiliar occurrence of a knock at their door. 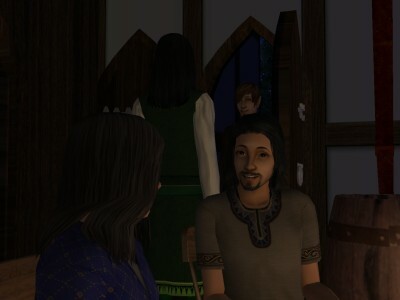 Dunstan leaned forward in his chair, trying to see who could bring a joyful reaction from Egelric and one of panic from Sela, who was already scooping up the babies. He feared it would be Leofric. “I might stay a while,” the man outside said. His soft voice bore an odd, whispering accent. It was not Leofric. 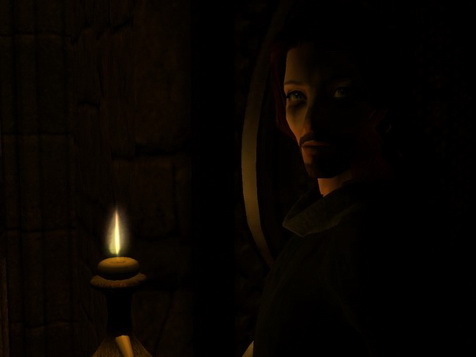 “I see Alred is here – oh!” He stopped short in the doorway when he saw Dunstan. The man was very tall and strangely dressed. 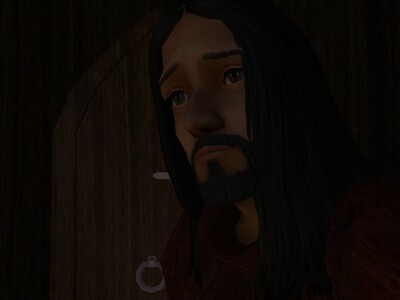 Dunstan thought he could only have been the elf his father had met several times before. 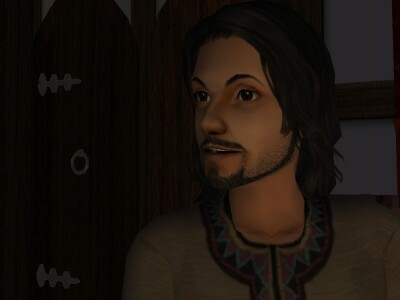 “This is my eldest son, Dunstan,” his father said as he went to greet the elf. 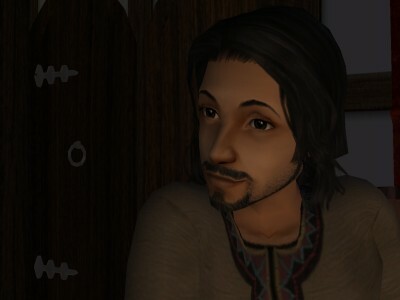 Dunstan rose with him, but he wished he might slip away as Sela seemed to want to do. 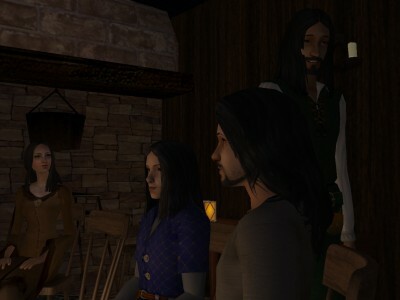 Iylaine was his friend, and Sela was sweet and kind, but all he knew of the other elves was evil. The elf held out a warning hand to Sela as she attempted to go cringing past him, and he spoke a few words to her in his strange language. There was nothing soft or whispering about his voice then. “What did you say to her?” Egelric asked. His own voice had a hard edge of annoyance. “I simply told her she might stay,” the elf replied, softly again. 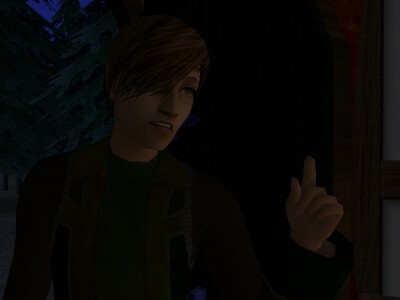 “Ears!” Wulf cried and pointed at the visitor. “That’s right!” the elf laughed. “Did you teach him my name?” he asked Egelric. 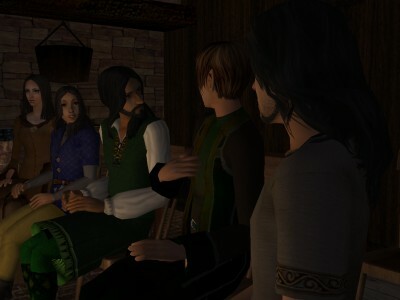 Sela cuddled Gils and turned miserably away from the men and the elf. 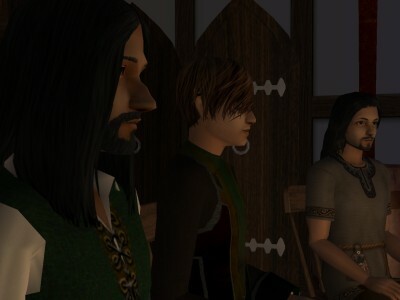 Dunstan stood apart from them and looked up at her. He understood precisely how she felt. How often had he been asked to stay with people when he longed to be alone! 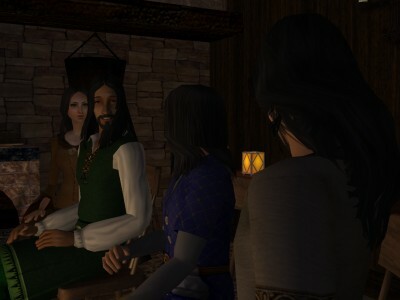 He sat beside her when they all sat again, determined to smile at her if she ever looked at him, but Sela seemed just as determined to stare all night into the fire. “Hmm! I suppose that’s good news,” Egelric said. “You suppose!” the elf laughed. 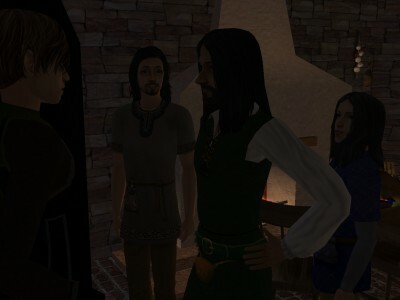 “Perhaps the woman killing the elves was its enemy?” Alred suggested. 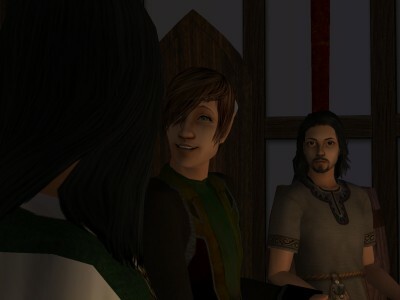 “Perhaps we could convince the demon to kill them too?” Egelric suggested with an ironic chuckle. Dunstan sat back in his chair and closed his eyes. Something profound, he thought, must happen when a boy became a man to allow him to discuss such matters with such equanimity. At least he hoped so, for if there were no transformation in his future, it was clear he would be a miserable excuse for a man. 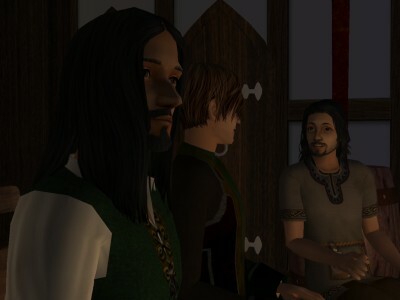 “Don’t you believe the word of a priest?” Alred scolded. “Is he so well-​​known?” the elf asked. “But does he write poetry?” the elf smiled. Now Dunstan was interested. The elf didn’t seem so frightening after all, and Dunstan could not understand why Sela seemed to cringe away from his every move. Indeed, he seemed quite agreeable now that he had begun to relax with the wine. He had stretched out his long legs until his boots were nearly in the fire, thrown back his head so the hair fell away from his eyes, and now he smiled. He was only an agreeable young man, Dunstan thought, and reminded him very much of young Sigefrith – when Hilda wasn’t around. 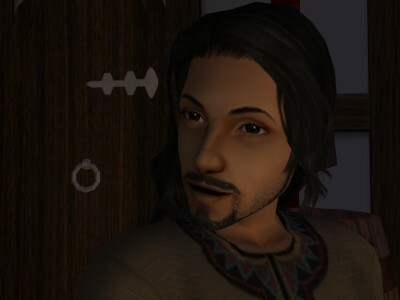 “You’re speaking to the wrong boy, Egelric,” Alred said. 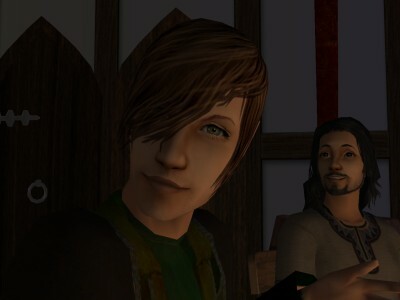 “I saw Belsar outside…” the elf smiled. “I was hoping he would give me some of his own,” Alred said. 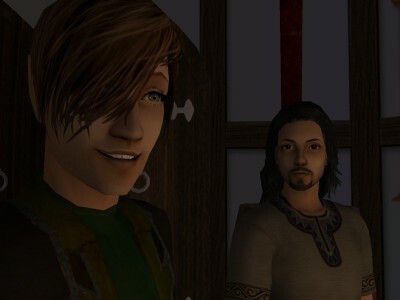 “I love it too much to so dishonor it,” he smiled, but Dunstan thought he had the look of a man who was only trying to be modest. The elf gave a sharp laugh, as if his father had meant it ironically. “Have you ever seen any other elven ladies?” he asked. Dunstan shrank away towards Sela. Everyone was staring at him now but her. Even Wulf had looked up at him upon hearing his name. The elf leaned over to look at him. His hair had fallen back over one eye, and the other was weirdly green – Dunstan thought suddenly of the venom of serpents, though he had never seen any – and its gaze was not kind. “Are you composing foolish lyrics already at your age?” he asked. “No!” Dunstan gasped. It was not quite true – he did not think they were quite foolish, anyway – but if he wrote poetry for Iylaine he never told her about it. He certainly wouldn’t admit it to this keen-​​eyed stranger. How he wished Malcolm were there! Malcolm would know what to make of him. 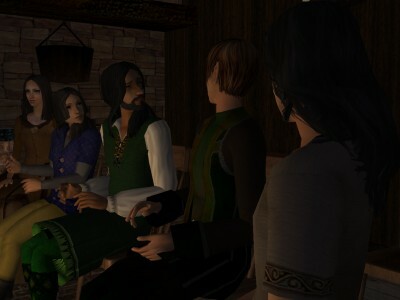 Every time he started to feel at ease with him, the elf would do or say something that would chill Dunstan to the marrow. “That’s the correct answer to give before her father,” Egelric grinned. Egelric grunted and took a drink of wine. The elf had sat back in his chair again and was staring down at the fire, or else at the toes of his boots at the ends of his long legs. Neither seemed to see the joke, but his father sat a moment shaking his head and laughing softly to himself, alone, as he very seldom did. Lothere how long did it take you to build Egelric and Sela's cottage? Ah, probably an hour or so. Cottages are easy when you're used to building castles. Aww. That last bit made me feel sorry for Vash. But I love Malcolm, too! Ack, I'm so torn! Wait, did Vash and Malcolm ever meet before? I know Vash knows of Malcolm but does Malcolm know of Vash? So its a one-sided rivalry, and now Dunstan's in on it too.... Things are going to get alot more interesting on the Iylane front. Malcolm and Vash have never met. Yet. Heheheh Dunstan hasn’t reached his obnoxious teenager stage yet! Feeling nostalgic and re-​reading some old chapters. There’s a lot going on in this chapter; I wish it were written in Vash’s or Sela’s POV. So is this where Dunstan’s crush on Vash starts?